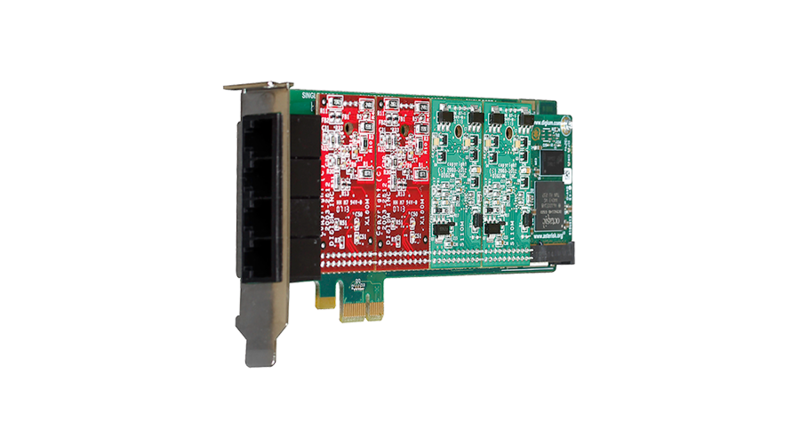 4 port modular analog PCI-Express x1 card with 4 Station interfaces and HW Echo Can The A4 Series of analog cards supports up to four (4) connections per card in your Asterisk system. Using Digium's single-port interface modules, A4 series cards can scale from one (1) to four (4) ports. The modular nature of the cards allows you to mix and match between line (FXO) and station (FXS) interfaces, giving you the exact port configuration you need. Digium A4 Series analog cards are available in low profile, half-length PCI and PCI Express form factors. Digium cards are compatible with all versions of Asterisk using the DAHDI driver framework. Asterisk and DAHDI are available for free from the Asterisk.org website. All cards include a five (5) year warranty and are eligible for Digium's Exceptional Satisfaction Program (ESP) risk-free Quality Guarantee.